The 2014 NFL Combine is now in the books. We will give recaps of the players that made money by improving their draft stock. Today we start with the offensive line that competed on day one. Last year, three offensive tackles went in the first four picks. I don’t expect that to happen again this year, but there are some really good prospects. We could have three tackles taken in the top 10, which is still an outstanding class. The top three tackles had very good workouts and some of the lesser known names also got some attention. Joel Bitonio – Nevada – Guard/tackle (6-4 302 lbs. ): Not a household name, but turned a few heads with his workout. May have elevated to the top tackle behind the “big three”. Has the ability to play guard or tackle. Played left tackle at Nevada. Good arm length. Great effort and has a nasty streak. Held his own against some very good pass rushers. Likely a right tackle or guard at the next level. Moves very well. Ran 4.97 40 yard dash (tied for #4 OL), 30.5” vertical jump (#2 OL), 9’6” broad jump (#2 OL), 7.37 3 cone (#3 OL), 4.44 short shuttle (#3 OL). Russell Bodine – North Carolina – Center (6-3 310 lbs. ): Played center for the Tar Heels. Very strong at the point of attack. Good lower body explosion. Good movement skills. Had 42 reps on the bench press, which was the tops for all players at the 2014 Combine. Had a 29” vertical jump (tied for #5 OL). Justin Britt – Missouri – Offensive tackle (6-6 325 lbs. ): Had 36 starts at left tackle for the Tigers. Tall with decent arm length. Plays with good leverage and balance. Keeps eyes up when pulling. Likely a right tackle or a backup that can play left or right tackle in a pinch. Dakota Dozier – Furman – Guard/tackle (6-4 313 lbs. ): Played left tackle at the college level, but likely a guard in the NFL. Very good movement skills. Nice kick slide in pass protection. Good knee bend. Smooth, but extremely raw. Matt Fieler – Bloomsburg – Guard/tackle (6-6 300 lbs. ): Good length, but has short arms. May have to move inside because of arm length. Limited athleticism. Tight hips. Very strong. 36 bench press reps, which tied him for the #2 offensive lineman. Jon Halapio – Florida – Guard (6-3 323 lbs. ): Played guard for the Gators. Does not blow you away with measureables, but looked good in the on-field drills. Has a warrior mentality, playing last year with a torn pectoral muscle. Has smooth hips and moves well. Does a good job keeping his knees bent. Jonotthan Harrison – Florida – Center (6-3 304 lbs. ): Has the ability to play center or guard. Has tight hips, but a strong lower body. Broad jumped 9’5” which was #3 for the offensive linemen. Gabe Ikard – Oklahoma – Center (6-4 304 lbs. ): Started 50 games at center for the Sooners. Has very good feet and is very smooth when he pulls. Smart and tough. Strong hands. Understands blocking angles and leverage. Had a 7.30 3 cone drill (#1 OL) and 4.37 short shuttle (#1 OL). Gabe Jackson – Mississippi State – Guard (6-3 336 lbs. ): Started in 52 games for the Bulldogs. Powerful, mauling run blocking guard. Average athleticism. His measureables don’t wow you, but he if you need a block on 4th and 1 you’re going behind him. Ja’wan James – Tennessee – Offensive tackle (6-6 311 lbs. ): Very good size and arm length. Started 49 games for the Volunteers. Started on the right side, but may project to the left because he is a better pass blocker than run blocker. Good kick slide in pass protection. Very smooth movement skills. Good knee bend. Wesley Johnson – Vanderbilt – Offensive tackle (6-5 297 lbs. ): Played every position on the line for the Commodores, but mostly at left tackle. May be more suited for right tackle at the next level, but he also got some snaps at center during the Combine. Had a 9’3” broad jump (#5 OL) and a 7.40 3 cone drill (#5 OL). Tyler Larsen – Utah State – Center (6-4 313 lbs. ): Started 52 games for the Aggies, was a 3 time all-conference selection and won the 2013 Rimington Award. Good overall size, but has short arms. Stout at the point of attack. Only average athleticism. Had 36 bench press reps, which tied him for #2 among offensive linemen. 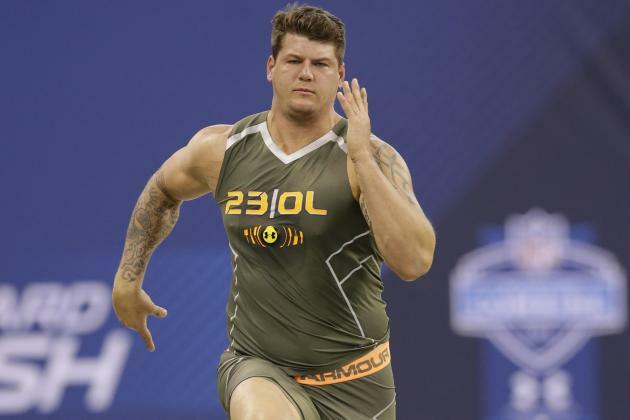 Taylor Lewan – Michigan – Offensive tackle (6-7 309 lbs. ): Star of the first day of the Combine. Started 48 games for the Wolverines at left tackle. Very athletic. Good flexibility. Very smooth and fluid. Nasty run blocker that finishes his blocks. Can be beat by inside pass rush moves. Extraordinary measureables. Ran a 4.87 40 (#1 OL), 30.5” vertical (#3 OL), 9’9” broad jump (#1 OL) and a 7.39 3 cone (#4 OL). Is likely to be one of the first 3 tackles taken. Jake Matthews – Texas A&M – Offensive tackle (6-5 308 lbs. ): NFL bloodlines, son of Bruce Matthews. Polished and professional. Very good footwork and technique. Quick feet. Does a good job keeping his hands inside. Good waist bend. Had a 30.5” vertical (tied for #3 OL), and 7.34 3 cone drill (#2 OL). Could be the first offensive lineman taken. Matt Patchan – Boston College – Guard/tackle (6-6 302 lbs. ): Former starter at Florida before transferring to BC when Steve Addazio took over there. Played 6 years of college ball due to injuries. May have to move to guard because of average arm length. Ran a 4.97 40 yard dash (tied for #4 OL) and a 32” vertical (#1 OL). Greg Robinson – Auburn – Offensive tackle (6-5 332 lbs. ): Massive offensive tackle that is a better run blocker than pass blocker. When the Tigers needed yards they ran behind Robinson. Good power. Light on his feet. Good waist bend. Very athletic for his size. Ran a 4.92 40 yard dash (#2 OL), 32 bench press reps and a 9’5” broad jump (tied for #3 OL). Is the #1 offensive tackle on some boards, but does not have Matthews’ pass block skills. Trai Turner – LSU – Guard – (6-3 310 lbs.) – Good run blocker with decent pass block skills. Held his own against some very good defensive tackles in the SEC. Ran a 4.93 40 (#3 OL). Could have probably used another year at the college level. This entry was posted on February 27, 2014 by draftmaniacs in All-Star Games and Combine and tagged 2014 nfl combine, 2014 NFL draft, Greg Robinson, Jake Matthews, NFL, NFL Draft, Taylor Lewan.